There is a wide selective of options available for your next trade show exhibiting needs. As with everything, some are cheap and others are expensive. 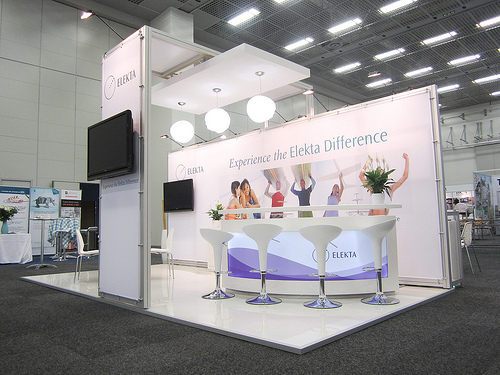 How do you select a trade show booth that is right for you and your brand, as well as your budget? Well, the best place to start is your budget. If you are a large company budget is no problem and you can afford to show off your company in the best possible light. If you are a small to medium size company, you need to seriously way up the costs versus what you think your return will be, taking into account fees you have to pay the show organizers. This post will focus on the small to medium end of the budget and give you some insight into just what you can get for your investment in a particular show. Shell Scheme is what you will be given by default by the show organisers. Your stand area will be whatever you have paid for and can be as small as 1m x 2m, with 3m x 3m stand been the norm. If your budget requires it or the show deals in large equipment, the standard size moves up accordingly. On a standard shell scheme 3m x 3m set up, you are given 3 walls, with 3 panels of white hardboard per wall. You will also be given a header board on the aisle side of the stand bearing your companies name. So you do have plenty of space to work with. The shell scheme providers do not like you attaching anything permanently or with screws into the hardboard as it damages them and they have no longevity, so best to come prepared to hang your signage or graphics with double sided tape or Velcro tape. Take into the consideration the cost of having some sort of branding done for you shell scheme. The hardboard panels are a standardised size and generally can have a graphic wedged in between the board and supported metal pole. Many exhibitors make use of pop up displays (or banner walls), which they place in front of the shell scheme and in 10 minutes their stand is fully branded. Pop up displays are perfect for re-use over and over again in various forms, not only for exhibition shows but general purpose marketing of your brand. Roll up banners also work well, they are just not as large. 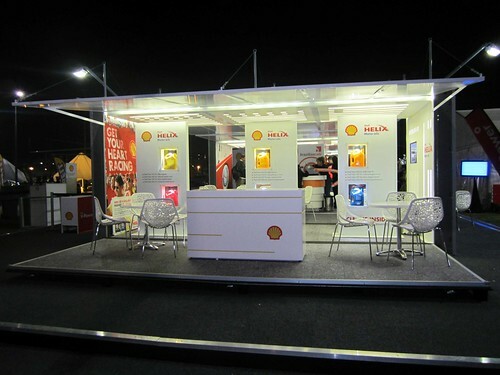 The next option up from shell scheme is to order a standard modular system from an exhibition stand company. Exhibition stand companies will generally have a standardised stands that you can order from their brochure and they just add in any graphics you may need. 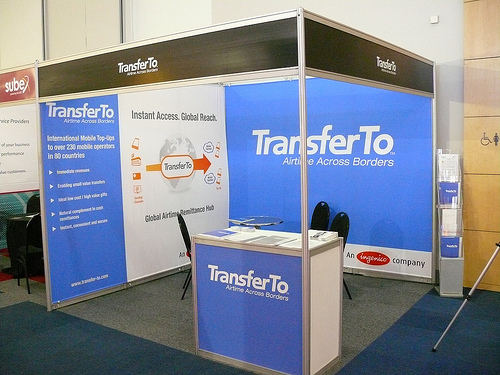 The exhibition company will make use of a system such as octanorm which they can use for a number of clients. The main reason for it being a good option for a cheaper custom stand is because it doesn’t involve a lot of modification by the exhibition company. You choose a stand that you like from their brochure, they literally pull all the pieces from their stock shelves, insert your branding and you are ready to go. With the main benefit over shell scheme being that it will make you stand out of the crowd more. Visit Budget Exhibits to view the selection on offer. Next up from a standardised modular system would be a custom modular system. Same principle as the standardised version except this requires a lot more work from the exhibition company. But the options on the finished stand are greater, for instance you now have the option of having a full wall graphic uninterrupted by metal poles, which adds a nice finishing touch. The finished product will definitely make you stand out better and should add a little more gravitas to your company or brand. But off course with the customization comes the added costs. But the end product will of course be a step up from both a standard modular stand and shell scheme. On a more or less same cost level as a custom modular system (or though can be more at times) is a custom bespoke stand generally built out of wood and requires carpenters (although if a company offers this option they will have in house or sub out the entire stand to professional carpenters based on their design) and a lot of on-site work involving joinery, sanding and painting. But the finished product can often be the most stand out design on the show, which means admiration for your company and brand. Another potential drawback of this type of expo stand would be the re-usability and storage if you decide to buy it and should be factored in, in the initial consultation with your exhibition stand company. So those are your main options before moving up to the next option of spending massive amounts of money on a fully customized large scale stand that will definitely make you stand out but may break your budget, best left for the bigger companies out there. Remember there are still other costs involved with exhibition stands. Things like furniture, flat screen TV’s, internet connections, gaming devices, stocked bar or coffee bars and interactive displays can all be factored in, to draw the exhibition visitors in. Don’t forget the real basics of electrical connections and water connections (if needed), also need to be pre -ordered from the show organizers.